Best NDA / Defence Coaching institute in Patna. Marg Classes in boring road, Patna has proved to be the top coaching institute for NDA entrance exam preparation or other defence exam preparation in Patna, Bihar. Unique and focused teaching methodology with excellent study material differentiate us from other coaching classes and this has led us to get success year by year. Our strategy includes concept clearing sessions, mock tests, doubt sessions and weekly tests etc. Marg classes in Boring Road, Patna provides best coaching classes for NDA entrance exams and best guidance to students aspiring career in Defence. NDA stands for National Defence Academy. This is most prestigious and honorable career option after class 12 and is a matter of proud for those who want to serve our nation. Any student who joins NDA or Defence after passing the entrance exams, gets loved by society. 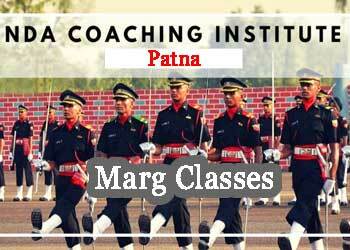 Marg Classes, Patna helps students get their dream career achieve. We have a great success record in NDA and defence entrance exams in Patna which is unmatched among the coaching institutes in Bihar. NDA entrance written exam is conducted by UPSC twice in a year. 1st in April and 2nd in September month. After passing this written exam, applicants have to face interviews, physical tests, team skills test, general aptitude tests, psychological tests etc. Minimum qualification required is 12th (10+2) from a recognized board or university. Physics, Chemistry and Math must be having in class 12th for applicants of NDA exam. Age criteria is between 16.5 years to 19 years of age and must be unmarried who apply for these entrance. Patna has been the education hub for various competitive exams since last 20 years. There are so many coaching institutes or coaching classes for preparation of NDA or Defence exams in Patna and some of them claim to be the best. We invite students or parents to our coaching institute in boring road, Patna and see the difference from others. See our success strategy. Understand our teaching methodology and standards we follow. For more information about classes, batches, fee, Course curriculum, hostel facilities etc., get in touch with our institute. You will find Marg Classes, the No. 1 Institute for NDA entrance exam in Patna, Bihar.